Here at the Cooler, in case you haven't figured it out by now, we like to talk about books. Sometimes, we even read the same books. We're going to try something new, and if we like how it comes out, and we feel it's received well enough, we'll continue it. This new feature will have Howie and Craig going back and forth electronically discussing something they've recently read. And to start off is the debut novel by Mike Chen, Here and Now and Then. This week, Howie started things off. Howie: Sometimes I think books hit all the right notes. This is one of those times. I think I first heard about this book in the middle of last year when it showed up on one of those, "if you like that, try this" lists but I quickly found out it wasn't even due to be published until February of this year. Thanks to social media, I found out the author liked video games, reported for an NHL team, and was dad to a young kid. So, I suppose you could say it was like someone who would join us for Shenanigans was writing a book. And given the description - a dad racing across time to save his daughter - it sounded cool. I dove into this book expecting to be wowed, and I was. We've read time travel books in the past, but something about this one was a bit different. I think there was more emotional heft to this one. Craig: I think you told me about this book about the same time I found it on the bookshelf at the Lockport library. Sci-fi books have always been a favorite for me, especially when they involve time travel. When I started reading Here and Now and Then, I realized that this was less the typical time travel story, and more a love story wrapped around time travel. By love story, I don't mean one of those sappy Nicholas Sparks love stories. I mean a realistic love story that we can all relate to, a story that captures everyday life. Add in some time traveling espionage, and we have a book that I could not put down. I know you're the king of pop culture, taking glee in all references to such (which is why Ready Player One is currently your all-time favorite book). However, I did find the references to Star Trek and Doctor Who to be intriguing. They didn't overpower the narrative and added important tips to the overall story. Howie: To be fair, Ready Player One is the book that got me reading again after years of not reading enough. But that's now what we're talking about here. We're talking a time travelling love story that goes against the grain by not having the two love interests be a couple, but rather a father and a daughter. You know more Doctor Who than I do, but I think we're both well versed enough in Star Trek to pick up on the nuances that Chen was able to put into his narrative. Specifically, I think the use of Star Trek II's line, "The needs of the many outweigh the needs of the few," is spot on. I think there are a number of time travel stories (All Our Wrong Todays, for example) that indirectly use that line of thinking, but in Here and Now and Then, it is an actual theme and you're right; it adds to the story. From what I've read about the author, I'm willing to bet we could have a lengthy debate about time travel's use in Star Trek IV when the crew goes to the past because of the needs of the many. That said, I think this story isn't so much about time travel itself, but what its consequences mean for the time traveler. Craig: I think one of the most intriguing parts of this book was the idea that the time traveler could not keep his brain split between the two times. The longer he stayed in an era, the more he lost from his original era. The memories of his future, when they came crashing back. It was a different narrative than most of the time traveler stories where they had advanced knowledge of the future. It kind of handcuffed the character into living as a real person in the time period in which he lived. His journal was an almost futile attempt to keep that tenuous grasp on his familiar future. Howie: Absolutely. It makes the realists among us happy to know that at least someone put some practicality into a time travel story. Remember that when the main protagonist is in his present/our future, there is a brain issue then, too. If we had the space or patience, I could draw parallels from that part of the story to the dearly departed NBC show Timeless (particularly the finale) or, if you want to use movies, the Mel Gibson and Jamie Lee Curtis movie Forever Young (featuring a young Elijah Wood) in which Gibson's character is frozen. When he is accidentally awakened 40 or 50 years later, his body ages that quick in a matter of days. Honestly, that's what I think works best about how time travel was written in this book. It's actually believable. Even the big question - "Why not kill Hitler?" - is addressed similarly to the way one of Star Trek's greatest episodes, "The City on the Edge of Forever," tackled the subject. The idea that even in the future, some things just aren't meant to be changed in the past, is oddly comforting. And the journal you mentioned, that is also a great, unexpectedly key component of the book and I thoroughly enjoyed how it became vital in the final third of the story. Craig: Kin, the main character, broke the rules. An accident strands him back in the 1990s, and instead of waiting for his superiors to send a rescue mission (which they eventually do) he settles into his new life. Then he does the unthinkable. He falls in love. He has a family. This results in the daughter who should never be. This becomes a bone of contention between his morals as a father and his training as a time agent. He doesn't think he'll ever be rescued, and therefore lets that wariness ease up. When the rescue does come, he realizes that his two lives cannot be rectified with one another. And his daughter is a time anomaly. The narrative of him trying to protect his daughter from himself is the driving force for the entire novel. Howie: Viewers of DC's Legends of Tomorrow will see what you just said and immediately pick up on Professor Martin Stein's daughter being an anachronism, right? Anyway, I completely agree that Kin's fierce protective nature drives most of the story. What I found was also well done was that his actual life and his life in the past had different "tentpoles" to keep him tethered to a subconscious reality, even if we as the reader were the only ones who recognized it. On a smaller scale, it showed that yes, we make our own destinies, but there are still certain things that we can't control and the sooner we realize that, the better off we all are. Meanwhile, how refreshing was it to read a story such as this one and not have there be gratuitous violence and death? I think this book could be optioned and receive no harsher than a PG-13 rating and still perform well because the story is one so many people can relate to, especially parents. Craig: I've always wanted to write a time travel story. The biggest obstacle to overcome would obviously be getting around changing the future and creating paradoxes. Chen kind of does what I would have written as a safety mechanism. The blinding headaches and blackouts when Kin tries to remember his future life work quite well with keeping his two worlds separated. I would have written my time travel story with something like that happening if the action you took would impact the future beyond a certain degree. Time itself would prevent you from taking that action. Time travel stories walk a very fine line. Some end up being so far out there that the story never coalesces and falls apart under scrutiny. What Chen has written neatly ties both ends of the story together without destroying everything he had built in the early parts of the book. And he leaves just enough implied in the background of the story to realize that Kin's past life was helping him, ever so very slightly, in the future. Howie: Looks like we're starting to wrap things up, since some of what we just said was pretty similar. That's cool. I think we've done a good job both dissecting and praising this debut author's work. 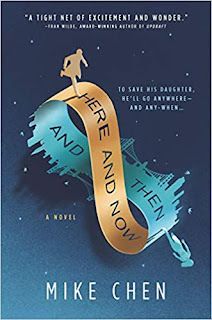 I'll sum up my end like this: Here and Now and Then is a thrilling time travel story that takes the intricacies of time travel from Star Trek and Doctor Who and sprinkles in just a dusting of the heart of Back to the Future. At its core, the story is about family, but throughout the book, themes of love and loss are evident. Even at the book's climactic moment, Chen is able to show that at crossroads of our lives, how we process love and loss can define our future. Of course, saying too much here would spoil a lot of the finale. I would highly recommend this book, and I look forward to seeing what gem Chen has in store for us next. Craig: This book had me searching the stacks at the library for other time travelling stories. I’ve found some that will work their way into my Top Ten of such books. I can tell you that Here and Now and Then by Mike Chen is definitely firmly entrenched in that list - high on that list. Even if you’re not a sci-fi fan, this book is worth it. It transcends the genre into some more. It’s worth the read. At the moment, Craig has read almost four times as many books as Howie this year. The next time their reading lists share a title, it is possible another joint review may grace this virtual space.